Today’s enthusiasm for using herbs to treat ailments, whether Echinacea (purple coneflower) as an immune-system stimulant or Hypericum (St. Johnswort) as an antidepressant, is not new. Native Americans of the Great Plains held Echinacea in high regard and prescribed it for snakebites, stings, toothaches, and the mumps. Ancient Greeks believed St. Johnswort would make evil spirits fly away. The early Christians used it in exorcisms. For some, it’s a mood lifter against present-day demons. An herb is a plant with a fleshy stem that dies back at the end of each growing season. It’s also any aromatic plant used in medicine or cookery. The Herb Society of America’s Encyclopedia of Herbs gives a broader definition that includes a wide range of plants. It states, "In addition to herbaceous perennials, herbs include trees, shrubs, annuals, vines and more primitive plants such as ferns, mosses, algae, lichens and fungi. They are valued for their flavor, fragrance, medicinal and healthful qualities, economic and industrial uses, pesticidal properties and coloring materials (dyes)." Herbs have been grown for many millennia, with some Egyptian herb gardens dating back 4,000 years. Their earliest uses were medicinal, followed by culinary, and then decorative. The same cornflower the Egyptians used (Centaurea cyanus) is grown today. This plant was originally used to treat eye ailments and alleviate fevers. Today its astringent properties reflect the same medicinal uses. Extracts of cornflower are added to hair shampoos and rinses. It makes a fine cut flower and a splendid dried everlasting. The flower petals are edible and can be tossed into salads for flavor and color. When the Chinese wrote the Canon of Medicine in 2500 BC, they tried to eliminate the superstitious qualities of herbs and stress the practical knowledge. For instance, chrysanthemums were useful, beautiful, and virtuous; e.g., one species was used medicinally, one was edible, and others were used for display. Today the chrysanthemum is used in much the same fashion, and its economic use as a low-toxicity pesticide (pyrethrum) has been added to the list of natural insecticides. Through the centuries herbs gained a wider audience. Medieval gardens included a range of herbs for the self-sufficient: medicinal, culinary, and decorative. Universities of that time had physic gardens for teaching botany and medicine. One of the most popular herbs then, as now, was sage. Sage (Salvia officinalis) has a healthy reputation. It is used to aid digestion, clear skin infections, ease anxiety, and more. The culinary virtues of sage include the use of its edible flower and leaf as a seasoning for rich fatty meats such as pork, duck, goose, and sausage. Certain salvias or sages are strictly decorative; they have no culinary or medicinal use. The seventeenth and eighteenth centuries led to the development of the formal herb garden, with France featuring some of the finest. Formal design involved an overall pattern of shapes using hardscape or plant material. Clipped herb hedges, geometric foundations, and subdivided paths lent interest no matter what season it was. 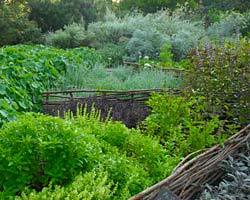 Formal herb gardens can be expensive to build and costly to maintain. During that same time period, basil was introduced to Europe from Asia and Africa as a medicinal and even sacred herb. It aided digestion and helped cure nausea and cramps. But it wasn’t until the nineteenth century that basil was used in the kitchen. Basil oil is used in dental preparations and insect repellants. Today it is one of the most popular herbs planted in kitchen gardens. Enjoy the virtues of the versatile herbs and see why they have been loved for so long. They are still what they used to be…and more.